Hollinbourne Road and its neighbouring streets (Ruskin Walk, Holmdene Avenue, Elfindale Road, Frankfurt Road and Danecroft Road) are a highly unusual anomaly. Ddespite being east of Herne Hill, which otherwise formed the boundary of Dulwich College Estate and the parishes of Lambeth, to the west and Camberwell to the east, they were never part of the Dulwich estate and until 1900, were part of Lambeth - not Camberwell. Their transfer to Camberwell was merely an administrative matter; but not being part of the Dulwich Estate had significantly affected their development. Dulwich Estate was a cautious and conservative developer of high quality housing aimed at potential pupils' families. 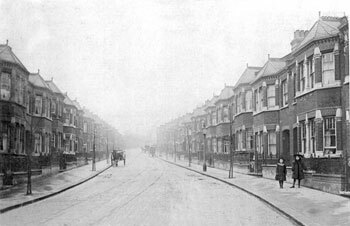 The streets were developed in the late 1890s and very early 1900s with good sized terraced houses and were typical of those to the west of Herne Hill, but much smaller than anything the Dulwich College Estate would have considered suitable.